It's not unusual to see pears, whether dried, fresh, or in spirit form, added to Swiss dishes. Pears have been harvested in the region that is now Switzerland since prehistoric times. These houses were a type of early settlement dating from between 5000 and 500 B.C. and their remains can be found throughout Switzerland, Austria, France, Germany, Italy, and Slovenia. UNESCO marked them as World Heritage Sites in 2011, and the Swiss settlements count for 56 of the 111 sites in the alpine region. Being on stilts allowed the sheltered underside of the house to be used for work or storage and their height prevented flooding and rats. These houses were built near bodies of water (in Switzerland they were often built around the marshy sides of lakes), though in many places the water level has since increased and some houses are now above or under water (initially it was assumed that they had been purposely built on the water, but this was later disproven). A list of all the Swiss pile dwelling settlements can be found here. A settlement on the Bodensee (Lake Constance) which is now over water. These stilt house settlements have been carefully excavated and preserved, and they give a unique look at life thousands of years ago. They also provide evidence of the food that was consumed at the time, including early forms of bread and porridge, as well as fruit like apples, cherries, and especially pears. The pear has been part of the landscape of what is now Switzerland for millennia, and it continues to leaves its fragrant, juicy mark on the cuisine of those who dwell in the region. However you pronounce it, this simple dish is the perfect marriage—juicy pears lighten the mash making it an excellent accompaniment to heavy stews or gravies, not to mention the sticky sweet onions that traditionally top the dish. The recipe comes from Marianne Kaltenbach's classic cookbook Aus Schweizer Küchen—more can be found in this post. Sprinkle the sugar over the bottom of a large pot, then heat on medium. When the sugar liquefies and turns to a light golden colour, add the pears and coat them fully. Add the potatoes and a pinch of salt, plus the water. Cook for about 30 minutes, or until the pears and potatoes are soft. 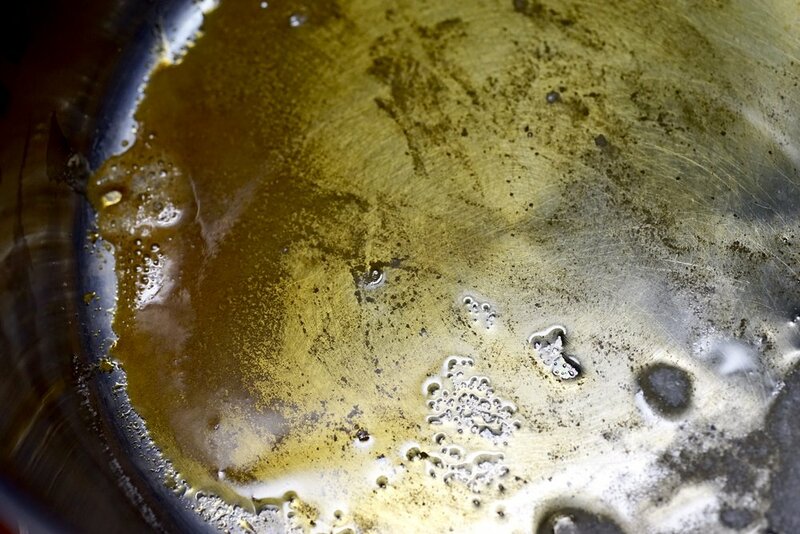 Meanwhile, in a medium frying pan, heat the butter over medium high heat until sputtering. Turn down the heat to medium low and fry the onions until they are sticky, sweet and amber in colour. Once the potatoes and pears are cooked, drain the pot and mash them with a potato masher, adding a knob of butter and a splash of milk. Top the mash with fried onions. It's best to use potatoes that are suited for mashed potatoes (like Russet or Yukon Gold, you want a floury/starchy potato, not waxy). These are mehlige (not festkochend) potatoes in German and are usually listed as so in the grocery store. A firmer, sweet pear works well here—try Conference, Kaiser Alexander (Bosc), or Williams (Bartlett). More on the Williams/Bartlett pear here. You don't have to neatly chop your pears—everything will be mashed together anyway—so simply peel them, then carve off the flesh, avoiding the core and seeds (see photo above). Be careful with the caramelizing and be sure to have the pears ready to go before you start heating your sugar. As soon as it turns golden, carefully add the pears (it might splutter!) and give them a quick stir.